There Lexington Corp. chartered multiple boats today to do some offshore fishing here in Ft. Lauderdale. With five or six anglers per boat the stage was set for some friendly competition amongst the Corporate sponsors and their clients, not to mention the crews aboard the various boats. Today was a bit breezy and while not too rough the seas were running about 2 to 4 feet as we cleared the inlet and headed out to the edge. 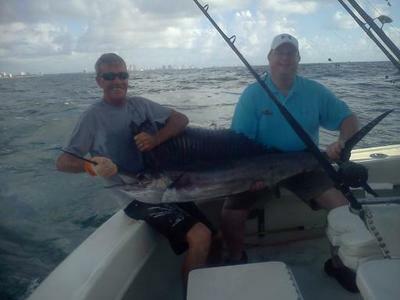 On many days here in SE Florida a bit of wind can get the fish a little more aggressive and today wasn?t an exception. That?s Shawn in the photo with his nice Sailfish which was the largest fish on our half day charter. We had slowed down to about ? a knot moving slowly forward as we fought a good Kingfish for several minutes when this Sail took a surface line off the ling rigger baited with a Bonito strip with a green and silver mylar feather fished up front. That particular Kingfish also took a green mylar rig which was being fished on the long planer rod. Once we got the Kingfish aboard and on the ice we went to work on the Sail and Shawn was feeling great after the catch and enjored the rest of the charter up on the bridge with me to allow the others a chance at a big fish. We did land several more Kings with the largest being about 15 pounds with Bonito, Tuna and Barracuda rounding out the catch. What with the wind today out of the east/ southeast we were hoping to come across some Mahi-Mahi as they like the wind as well but we had no luck there and neither did any of the other boats involved in the charter this morning. Maybe tomorrow on them if some of the wind stays up.